Pictures! I'm finally home by daylight, on my own, without being crazily busy, so I decided to put my somewhat camera-shy self in front of the camera to show you something I found at one of my thrifty market stalls last week. First up something less intimidating. 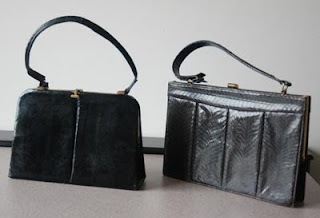 These two handbag were mine for 8 euros. There's a good bit of age to them, which shows in their nice clasp closures, leather linings and old-fashioned pulls on their inside zipper-pockets. They've also both seen better days. Especially the handles are in a sorry state. I'm thinking about replacing them. I've got some black metal chain in my stash, but it should really be yellow metal, don't you think? The one on the left might be eel-skin or reptile and the one on the right snake. However, on close inspection it is clear that there made from leather or even plastic stamped to look like exotic skins (which is good). The 'snake-skin' looks like paper with plastic scales on it when you study the torn bit at the handle. I'll have to ask my bag-o-philiac friend if she can date them or tell me anything more. 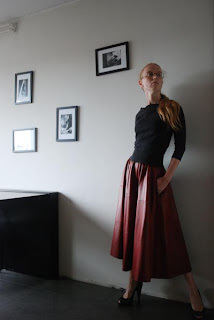 It's a half circle skirt in soft red leather. Oh, and it has pockets. I'm always on the lookout for cheap second hand leather items which I can cut up and use to make bags. This one, I found at a stall where I don't usually shop. It was 5 euros. I was intrigued by it but had my doubts about the elastic waistband. But at that price, what could go wrong? It would either be a special garment for me, or several bags. I know, I promised you pictures of my recent vintage/thrift finds. And I haven't delivered. Tomorrow I'll make up for it, I promise. 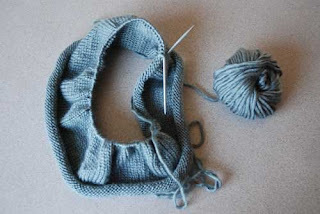 Knitting isn't really my sort of thing and although I finished the cowl-thingy I started on, I'm not happy with the result (the yarn was from stash and didn't last anywhere near as long as I hoped). And although I love pattern making, all that paperwork without even being able to try out a single thing get discouraging after a while. Now the complaining is over and done with, I should tell you something. There was a reason why I mentioned my recent DVD-viewing to you in my last post. Costumes! Whenever I focus on something, I tend to develop some form of professional deformation (literally translated from Dutch, so I'm not sure whether or not that makes any sense in English) pretty quickly. So whatever I'm watching, I can't help but notice the costumes. The costumes are very nice indeed. Rich in detail and you can actually see the passage of time in the changing fashion as well as in the aging of the characters. I have spotted some (mostly) ladies' styles which I don't believe to be genuine 16th century fashion. Anne Boleyn's dancing costume from season 1 for example, and at the end of season 2, you see Jane Seymore in a dress which shows her natural body shape, not as you'd expect, the angular lines of period corsetry. One thing I missed in particular, was a fashion said to be introduced at the Tudor court by Anne Boleyn. The lady supposedly had an extra digit on one hand which she would try to hide with a clever choice of clothing. In her time as queen she introduced dresses with long, trailing sleeves or decorations at the sleeve which would cover part of a lady's hand. These comments however, should not even be considered criticism. Of course, choices have to be made when the 'look' of a TV-series is created and it would be impossible to put every detail in. I'm a bit late in posting about this dress. I actually finished it a few weeks ago, but for the reason I posted about before, I didn't get the chance to photograph it until today. Just one picture for now, because I'm actually pretty tired and don't feel much like modeling today. I feel like I should apologize for the lack in posting these past few weeks. I've been incredibly busy helping my wonderful friend and indie designer M design, draft and sew an entire summer collection of 16 pieces, in just one month. It's almost done now and I promise to try and get back to more regular posting by the end of next week. I still managed to make two garments which should get some attention here. So they'll be up first, as soon as I have the opportunity to take some pictures.